Running Press Kids, 9780762447282, 320pp. Ever since he was a young boy, music has coursed through the veins of eighteen-year-old Anthemthe Corp has certainly seen to that. By encoding music with addictive and mind-altering elements, the Corp holds control over all citizens, particularly conduits like Anthem, whose life energy feeds the main power in the Grid. Emma Trevayne's dystopian debut novel is a little punk, a little rock, and plenty page-turning. Emma Trevayne is a full-time writer. She is an avid music collector, a lover of computer code languages, and a photographer. She has lived in Canada, England, and America. Follow her on Twitter @EMentior. "The action is engaging and fast-paced, propelled forward by the authentic and sometimes conflicting interests of its likable cast of characters. . . . The ending is tense and sensational, and readers won't feel let down by the action." 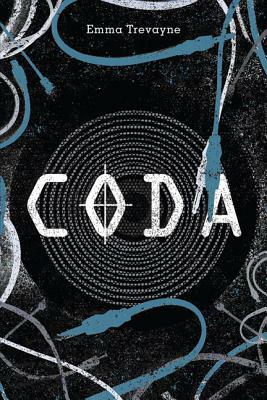 "Coda has a cool-factor unlike anything I've read. A cyberpunkpart dystopian, part science fictionthriller set in futuristic Manhattan, with the requisite gadgetry, romance, and the added benefit of a rockstar? Sign me up." "[T]he rhythm steadily climbs and you only fall more under its spell. By the time the song is nearing its end, there's only the tempo's speed and your heart is racing to match the pace of the song because you're wholly invested now. And when it all ends, when the last crash of the drum sounds and the singer drops the microphone, your heart is gargling in throat from all the rioting and fist-pumping you've done and you can't wipe the smile off your face because it was a damn good ride." "This book is ripe with danger and suspicion, and it highlights the key points of a dystopian setting. The horrors of an oppressive corporation and their corrupt goals, the dreary and dismal setting, the unflinching desire to keep those you care about most safe from harm, the overwhelming search for identity in a world where everyone is forced to be the same, and the discovery of limits, of how far we will go to stay alive."